Update 1: It appears that every one is getting an email from the Indian Passport service about passport verification which also involves a physical trip to a Passport office located in India! Hoping this is an oversight. What’s even more baffling is that typically when you do get a new passport or renew it, you are subject to this verification anyways. Does that mean that the passport service has no faith in its original verification?? Whoa! Didn’t see that coming! In just 6 days from signing off, India is now live in the GOES program. Last week, i had written that India had formally joined the Global Entry program. This has been a process that has been ongoing since 2015, and only in 2016 did the formal Memorandum of Understanding get signed. India now becomes the 11th country to have access to the Global Entry program. Of course, you need to have a valid passport and American Visa before you can think of applying for Global Entry. Global Entry is currently available at 53 US airports and 15 pre-clearance locations. 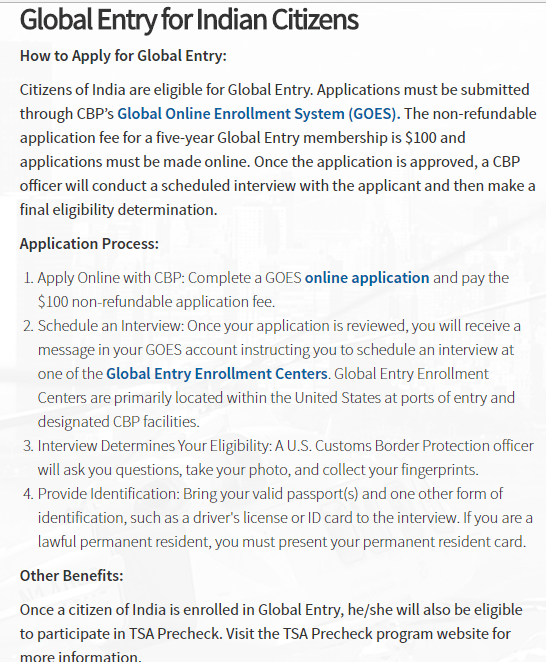 Here is the process for Indian citizens to join the Global Entry program. I just put my application in but am seeing data points online of folks receiving notifications from the Indian embassy for additional passport verification. So this process might not be as smooth as it should be….will update post as more info comes around. Next Post Ugh! Somehow the Indian govt. managed to screw up the Global Entry enrollment. I’m guessing this is an oversight on the part of the Indian govt. The majority of folk this would be useful for would be living in the US. Hopefully it gets fixed soon.